AAAX Tours and Day Trips from Cape Town. Cape Town City morning or afternoon orientation tour rich in hIstorical heritage and scenic spleandour. Table Mountain (cable-car ticket not included). Camps Bay (millionaire's mile) and Clifton (fashionable beaches) coastal drive. South African Museum and Company gardens. Houses of Parliment, St George's Cathedral (Desmond Tutu's church). City Hall and Grande Parade (Site of Nelson Mandela's freedom speech). Castle of Good Hope and Slave Lodge. The flower market and Green Market Square. Bo-kaap traditional Malay Quarter. With the option of being dropped off at the V & A Waterfront to book for a Robben Island tour. Morning or afternoon tour. All the above with a registered and experiences tour guide in an air-conditioned mini-bus. Cape Town Mother City Tour Enquiry Booking Form. Don't be disappointed - book way in advance. Includes picnic lunch and entrance fees to reserve and penguins. Includes picnic lunch and wine tasting. We depart the city for the Franschoek wine region in a luxury air-conditioned mini-bus, where we begin our gentle cycle along the quiet Robertsveli Rd - 7 kms into the town of Franschoek. We explore this charming French Huguenot village, then cycle on a further 3km to Augusta winery, where we stop for a wine tasting and cellar tour. We then Continue a further 2 kms to Mont Rochelle winery for another tasting and a well-deserved picnic lunch amidst spectacular surroundings. After lunch we Mini-bus transfer to the picturesque university town of Stellenbosch, with it’s distinctive Cape Dutch architecture, ending with a final tasting at Spier winery, before transferring back to Cape Town, well exercised, well fed and well “ watered” - a great combination of activity and revelry. * NOTE exact wineries may differ depending on availability. Tuesdays, Thursdays and Saturdays only. Cape Winelands with gentle Cycling Tour Enquiry Booking Form. R750 per person. min. 4 persons. 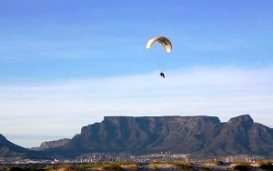 Includes: Transport to Table Mountain, bicycles, helmets, guide, entrance fees, drinks & snacks. Duration: approx 5 hours. We begin with a warm-up ride on the tar along Table Mountain road, then go off-road along a dirt track and up to the King’s Block House for sweeping views across the city and the Southern Suburbs. We then cycle downhill to the imposing Rhodes Memorial, where you can choose to enjoy some refreshments in the beautifully situated tea garden, before heading back via Deer Park with some exhilarating downhills and a few challenging climbs back to the bus - suitable for beginners and experienced riders. Table Mountain Biking Enquiry Booking Form. Penguins at Boulder's Beach. Now off to the Cape of Good Hope Nature Reserve. At the entrance we swop four wheels for two wheeled bicycles to enjoy a leisurely ride with nature. A scrumptious picnic lunch is served (please don't feed the baboons) afterwhich you may want to enjoy a swim in the wild Atlantic Ocean. (don't tease the sharks) The hike to the top lighthouse at Cape Point and the Cape of Good Hope offer breathtaking vistas of the most South-Westerly point of the African continent. Been there - done that! Cape Point Hiking and Biking Tour Enquiry Booking Form.